Rocket through the rock gardens. 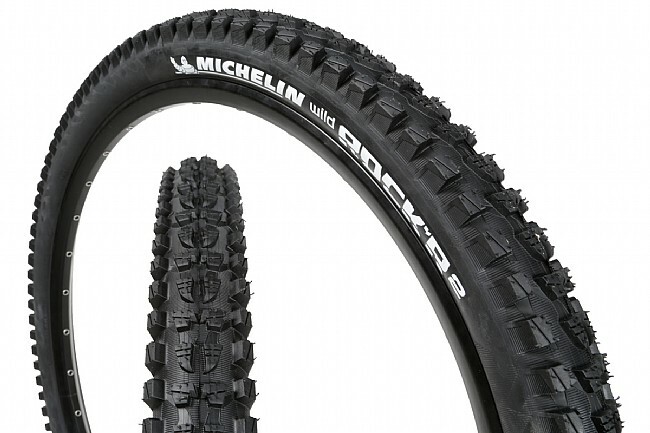 Michelin's Wild Rock'R2 Advanced Magi-X Reinforced 29 Inch MTB Tire is designed to handle the gnarliest of Enduro terrain. Its reinforced casing has a bead-to-bead breaker barrier that protects against sidewall gashes and impact punctures to give you the confidence to point your bike anywhere and rail it. Alternating transverse and longitudinal center blocks provide a balance between rolling efficiency and braking performance, and the large shoulder knobs ensure accurate and predictable steering. All blocks feature sipes to enhance traction on slick rocks and complex terrain, and the Magi-X rubber compound was formulated to provide the best traction with excellent grip during high-angle cornering and severe braking. Tubeless ready. Folding Bead. 30 tpi casing. Available in 2.35" x 29". Claimed weight is 1150 g.
Note: For the best possible performance, Michelin recommends using their Magi-X compound as a front tire and their Gum-X compound for the rear. The only tire I have found that can withstand the extremely sharp rocks of central Arizonas backcountry trails. For years, I've cut sidewalls and punctured the tread on all of the toughest tires. The Wild Rock'R is the first tire I've worn the tread out before the sidewall for at least 5 years.